I have been casting and loading up the Ranch Dog TLC432-285-RF for my Rossi 92 chambered in 44Mag and also the C358-180-RF for my other Rossi chambered in 357Mag. Im using straight air cooled WW but the only thing I have shot with them is mainly paper for accuracy testing besides a few plastic water filled jugs and my old digital camera. Click here for video. With the possibility of being able to hunt with my Rossi next year here in Indiana I wanted to see how these expand and hold up with air cooled wheel weights. 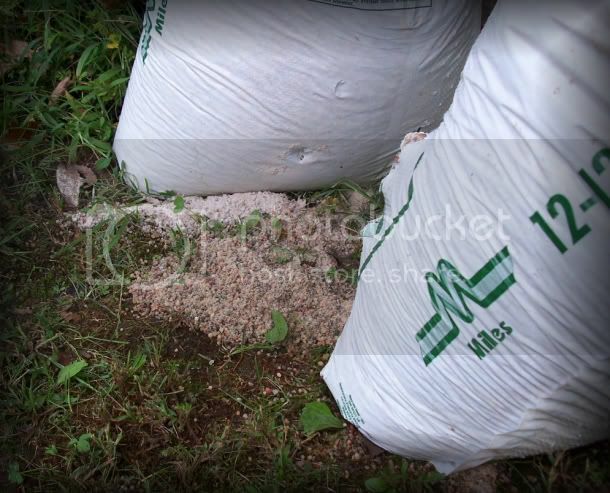 I used two old bags of fertilizer I had lying around and they went through one bag and just dimpled the other. The Ranch Dog TLC432-285 weighs around 276 grains without the check and lube and the average velocity is 1470. 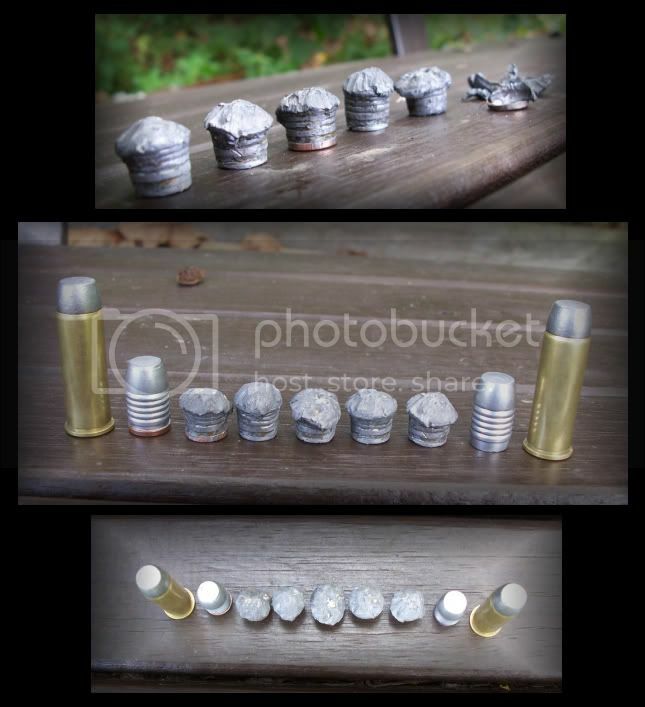 The recovered cast bullets weight on average was 204 grains and only one recovered had the gas check still attatched on it. For this test the recovered Ranch Dog cast bullets shed more weight than the C358-180-RF. I think due to the bag being full and more compacted and I tested the 44's first. After five rounds of these flat faced 44's there was plenty of fertilizer that had been turned into dust(OH YEA!). The bag wasnt as full by the time I sent the C358-180-RF sailing through it thus less shearing and weight loss. The C358-180-RF weighs around 182 grains lubed with Felix lube and the recovered cast bullets weighed on average of 165 grains. 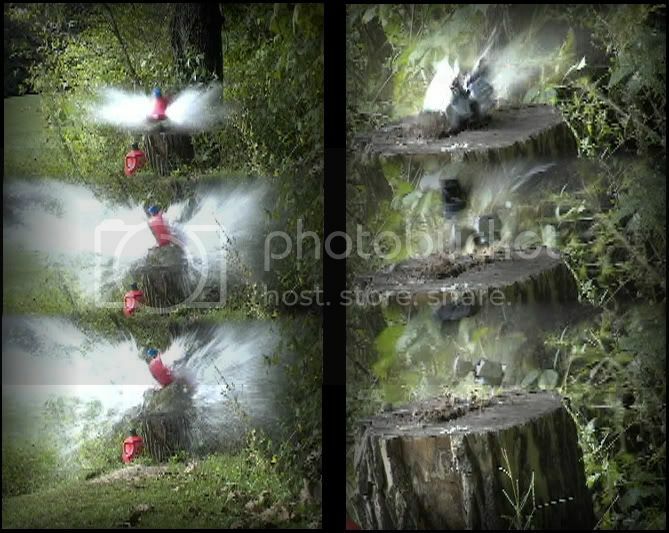 Here is a couple still shots from the video I took of me shooting the jugs filled with water and my old digital camera that laid down on me. I got the camera in the end though. 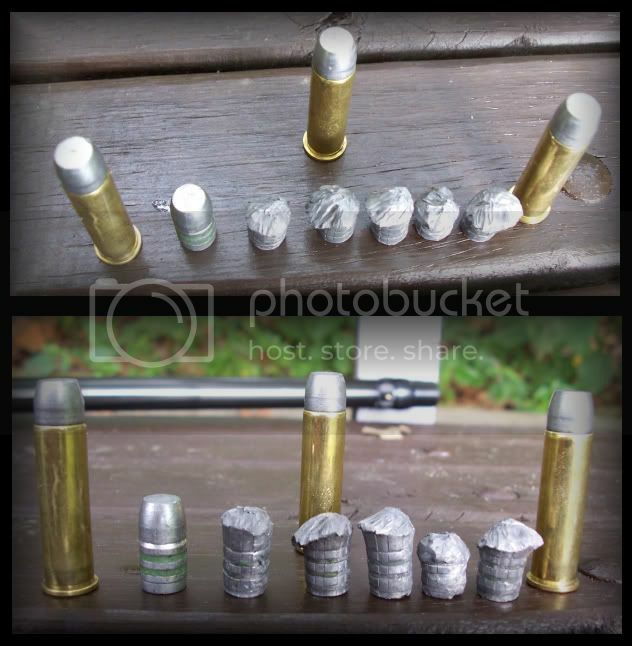 I will be testing different media as time allows for these cast bullets and will report the results.